I'd like to share something I posted in 2006 and get your input. On the morning's news I heard how a high school across the river in New York allowed its students to come to school in costume yesterday. Mostly pirates, a few Gene Simmons' and one in particular which gave the principal another 100 gray hairs. A senio r came as Hitler. The whole get-up, Chaplin moustache swastikas all over his sharply pressed uniform, riding crop in hand, high leather boots ... the teachers were in cardiac hyper-mode, many fellow students duly outraged and of course, it made the news. Adults weren't sure to look at him or not. It raised a visceral disgust we all understand. The young man explained he was a "parody" of a famous person from history, what's the problem? And indeed, after pow-wowing this matter a bit, the principal could not get the boy to please either change or leave, he was being "offensive and disruptive". They asked if his parents knew; he proudly exclaimed they DID and supported his "courage" in exercising his right to free speech, freedom of expression, all those good "frees". So basically they were raising their son to ignore everything they saw and heard unless it adhered to his right to freedom of expression. Pretty shallow. We don't live in a vacuum. B ut I heard something at the end of the broadcast which made me think (I dared myself). At the end of the day, the young man took off his gear, put on a large coat and made his way to the subway which he used to get home. Isn't that odd? Every other kid went home in costume, since that's how they arrived. But this one didn't, something inside him KNEW he couldn't get on that subway, with adults instead of teens, with real people he didn't know, dressed as "a person of history" responsible for so much anguish and blood-letting and pain that it hurts just to think about. He KNEW someone on that train might even be one of the slowly dying-out survivors of the holocaust, exactly what would he say to THAT person? So he KNEW. He knew something his parents forgot. And I lay this at their feet. Do you think this teen will ever understand the difference between an indecent act and just plain cruelty? Not if his home environment tells him the First Amendment is more important than abusing those same rights. It's ludicrous. We have rights to be decent people. When a teen does something outrageous like this, I think he's really just acting with the arrogance of his youth, doesn't see the hideousness of parading as Hitler for a laugh. He knew he'd cause a stir, he did, and I really think that's all he wanted, nothing about the First Amendment was on his mind at all. That was his parents, and therein lies the blame, and hopefully instill shame, that the people responsible for the formation of a decent human being could get things so mixed up and permit such a caustic, cruel act - worse, using their own son to do it. He, of course, was happy to oblige as most teens are where causing a mess among order is concerned. That's nothing. I really would want to hear how these Constitutionally-minded parents would explain it all to just one Jewish person, just one. But talk about scary, I pulled this thread out further and found a monster I couldn't talk away: the monster of the future. Right now, a kid could dress up as Alexander the Great and gets kudos and candy, no one would think twice and in fact cheer on his or her originality. The millions who died at the orders of Alexander, a true killer, a soldier in his time which again were times of war. I know there's no comparison to the two men, yet both were adored in their time by the people they killed for, those who demanded the death of others. My real point is that no one would take offense today at a "parody" of Alexander the Great. So it will happen, then, that someday in the future another kid would look forward to Hallowe'en with his HITLER costume, go out in public, get candy and kudos and no one is offended or outraged. THAT'S the monster that would keep me awake at night. It's happened already and will happen again - where humans allow the healing balm of time to dull memory, even historical fact, and on we go none the wiser for the lessons of the past. at the beginning of the end of summer? mellowing from the unseen cold. meant to please - which they do - as they glimmer. Who, from the sight, would turn from it? This is what God, for us, did commit. I stand to offer highest praise. Side by side, one of these is a comet, the other an asteroid. Similar aren't they. It's not till the sun heats the comet that we see the familiar tail of dusty ice. Don't you love asteroids and comets? Speaking of asteroids in a minute. These images of Jupiter are shown in true color on left, and enhanced for detailed on right. Exact same area. It's been almost 20 years this Sunday since humans launched Galileo into the realms of Jupiter. What we've learned and seen since the 1990s is incalculable. But the craft was making discoveries long before it arrived. 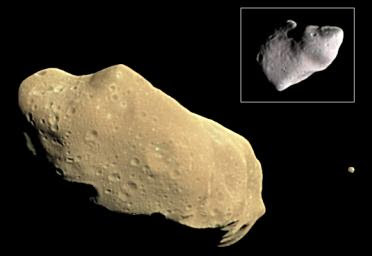 BELOW is the amazing asteroid, IDA, with its moon DACTYL. The tiny dot to the right, middle, is the actual picture and size of Dactyl. The upper right shot is to show a better view. Imagine a moon orbiting an asteroid. If IDA left its asteroid belt, we're have nowhere to hide. Yikes. It's a reminder that it was our special emmisary Galileo who brought us those unforgettable images. You see those 3 dark comet parts? 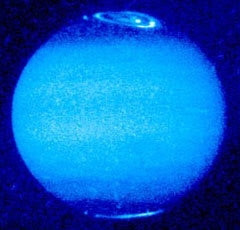 They're not impacting Jupiter actually, they're exploding in the gaseous atmosphere of Jupiter. Just like it would happen here on Earth. It would break up into many, smaller parts. By the time a piece reached the planet, it would leave a just small crater. But we know that's not how it always happens - look at the Moon for instance, or Mars. They have no atmosphere; a "small" piece of comet could reach 10 miles long. Fascinating! Now that we can congratulate ourselves on how much we love our children - more than anything - anyone - would kill for them if we had to - here's the part of the issue we always shrink away from. It's just too painful. Too far beyond our everyday experience. If you have a strong, caring heart, watch these 2 videos. The truth is, all children are everybody's children, and the next time you see someone hitting a child on the rear in the supermarket, or screaming at a toddler on the sidewalk, I implore you - don't hesitate to wonder if it's your business - go up to that adult and defend that child! Your child. My child. Everyone's child. Remember, these videos are rough. This is the subject we don't like to think exists, that grown adults can be so cruel, so utterly without care for our helpless little ones. But it's all too common. COPY PASTE WATCH. Then hug your child, any child, and cry. But if you can't watch, just ignore it, who could blame you. Yes, I'm afraid I've been sicker than I thought possible for several weeks now, hence my long absence. I even hallucinated a bit that I was inside a giant clam, very much like Venus here, but instead of a robe I was being handed a tiny box of Kleenex. Yikes. Today seems more manageable so I eagerly want to get back to this little psychological journey you took with me. Selfishly I do hope you read every word, and consider carefully a comment - or not - but could you please read it all. Thank you! It makes a difference. All of you responded so passionately about an act performed in the tens of thousands each day, but just not by you or to your beloved ones. Someone else's not-so-beloved ones. Surely they count to someone? I'm afraid that's not a given. Real flesh and blood parents throw out their kids daily, they beat them, starve them, sell them, and worst of all, ignore them. Is it as simple as people who keep journals make good parents?? It would seem they certainly make eager ones! While it gladdened my heart it made me think - of honesty for one. "I'd die for my child." "I'd kill for my child." "I'd kill you then myself for my child." I know you mean this. "I'd give up all future personal happiness for my child." That's the other half of what you're saying, isn't it? I notice DB and Mt. Dora took special note of the "no exit clause" when I quantified this question with "if you had no choice" which of course means, you would have to kill someone. And I saw immediately and not surprisingly that women (between the sexes, the majority keep journals) react with fierce almost defensive protective instincts, opting not to address the scenario by stating they'd not kill anyone at all, or kill themselves which is the same thing, seeing life as precious in all forms now that they've given birth to something living. And I believe men feel the same paternal tug, just sans a uterus. But again, that wasn't the scenario. As DB wisely notes, someone will have to die - and you'll have to kill them. Can you? It's easy to play it safe. I think you're thinking, no parent could kill their own child what a ridiculous question. Maybe those parents who suffocate infants just don't keep blogs, but I know they're out there and they're not all psychologically challenged. They're part of the body human - not Satan's seed. So we'd basically choose our progeny over the needs of our heart. We'd sacrifice personal emotional fulfillment as long as we could keep our children, is this what we're saying? (For Christian folk, in the bible God sort of did the opposite didn't He) Anyway it's noble, human, not surprising, but for some reason I thought a few folks skirted around the whole issue - if there's no other way, your partner would die, your child would live. And you'd live with...what? Well your child for one, and all that entails, all the joys and sorrows, the surprises and headaches, the moments you want to freeze in time. Then I wonder - what kind of parent would you be? You were forced to kill your most beloved partner to keep your child. There's nothing absolute here, it can't be either right or wrong because deep inside we all want personal gratification from another human, yes? Not a child either, that's another form of satisfaction. I also notice age played a part in this - if someone lived a long life you wouldn't have as much of a problem killing them off. Notice at a funeral people are not as sad if the deceased is over 75? If they're young, it's "They had their whole life" if they're old it's "They had a full life." I think we really go to great lengths using so many of these rituals and mantras. But when WE cause the death? And it's not a crime but a proposal, a decision? What makes one person more important to you? For parents, you've known your child it's whole life, I'm assuming - and know your partner alot less - and in your answers I hear "My child needs me more than my husband" ...... how do you mean that? Is it "My child needs me more than my husband needs me" or even "My child needs me more than I need my husband" Could it be that it's not someone else being less "valuable" but a child being SO MUCH MORE PRECIOUS as to surpass any value we can assign to it? DO you need your child more than you need an emotionally fulfilling partner, a beloved, a soul mate, a help mate? Okay most of you are thinking, what's the difference without a child. Why have a life mate if I have no one to pass on my happiness and love to. But alot of people do it, they don't want or NEED a child. Don't we always see them as a bit selfish? Come on, be honest - DON'T WE? Or just put ANY word in place of "husband" it's a matter of the NEW LIFE we place into the world and our reaction to it - our responsibility maybe? Well since when did it become incumbent upon people to be automatically responsible because they're parents? Let's be real. It's just something that should happen and makes us feel better when it does. But it just isn't so. D oes it have to be connected to love? Oh yes. But truly unself-ish love. If you love a child but are not responsible, not the best possible person to raise it, it's difficult but self-less to let a "better" person do it. Like it or not, our children represent something we believe is "ours" something we own, surely something we have rights to. In our heart of hearts, can ANYone ever be as good a parent as we believe we are? (Of course, but we'll never admit it, we'll rant and rave about how we're the only possible perfect person to raise our child - there's that instant "ours" possessiveness. What about a good child, were our parents happy with us as children? Did we fulfill their lives? More importantly, why should it be someone's responsibility to complete us, especially a child? And even now in life, I think we're still trying not to disappoint our parents. It's nothing to do with love. It's more basic. Is your child at this moment trying to be the happy center of your existence, and weren't you, and me? I wonder how we, so young and untried, knew there were certain people we should always please, even without understanding the vocabulary. Could it have been something as basic as "I won't have a full stomach if I don't"? If I were emotionally starved for affection because I chose my child over my partner, (and don't forget, I killed him/her) how would my child react to my sadness? Daily. What would I be silently teaching it? The nobility of parenthood? The need for a killing instinct? Or that it's their fault Mom's always crying. For those whose parents are still living, now that you're no longer a child do you still feel beholden to them, feel obliged, to listen, obey, respect etc? More than likely. We learn to feel these things, I don't think they're part of the "human package" when we're born. So, as an older person now, and a parent yourself, you would kill your parents to save your child, you certainly as much as said so. I suspect your parents would've reacted very similarly to save you. We become what we're given as we grow, I'd say. There's really no set answer here, only passions. And most are "cop-outs". It's not "I'd do anything for my child" or "I don't like killing but my kid comes first" etc. It's a direct situation of choice where you will either kill your lover to save your child, or vice versa. That you love your child was a given in this scenario. In the real world, it never is - many can't rise to the emotion of even liking their progeny, they never bond and can't understand parental instincts to foster and protect. Still, look how much feeling most put into defending our unbreakable bond to our little ones! Incredibly human and perfect -- in a perfect world. To the dear friend who decided she had to answer for both men AND women :-) your comment made me smile, I could sense the power behind those words, and to all else I think you we re as honest as you could be in the moment, not needing a scripted second's worth of thought to form your answer. That says something in itself - "My child comes first". But what? Well, something very human to my mind. We seem hard-wired and almost programmed to "need" to care for small, helpless things, and surely our children arouse a unique, undeniable urge to cover them with our bodies if we must, to shelter them from life's unfair rules. Bringing life to bear changes you, men and women alike. Would anyone disagree? Remember that little boy who fell down into the gorilla enclosure at the zoo, and the ape, our 99.9% genetically identical cousin, held him gently, understood something basic about how frail he was, took him out of the rain, etc. Yes, we're hard-wired alright. An old story goes that a man was fully prepared to kill his son when asked to do it by someone he desperately loved. Fortunately, I know of no deity demanding we sacrifice our children on a mountaintop to show our devotion. Thank you all for explaining how you feel and why. I learned from this, as I hoped to.